If you like simulator games especially free animal games then we bring you the best of 2015 that is Angry Got Simulator. This is latest in Goat Simulator 3D category to bring you most interesting and challenging goat simulation gaming experience in 2015. Download the Angry Goat Simulator for FREE now and get 100 BONUS Coins. Angry goat simulator brings you the best animal simulator & Goat simulator game in 2015 with amazing 3D graphics, realistic smooth game play, and cool 3D animations. Explore the beautiful village environment with your angry goat by moving around the field. This crazy goat will do rampage as much as possible being an Angry goat. Goat is full of power and energy so no one will get escaped from this Angry Goat. You can move around the village, farms & the jungle destroying property & attacking people. Wreck the fences & farms in the village. Play with the kids & attack them to get bonus coins. This game is designed for peoples of any ages including kids, boys, girls and adults. 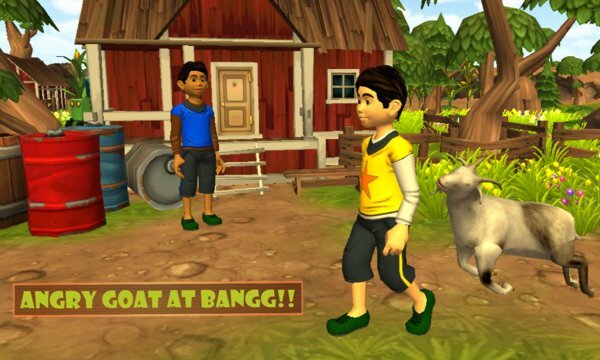 All game lovers MUST try it out as its best even for kids as a kids game, you don’t have to scare and best thing you can do when confronted with an angry goat is slowly walk away. This new goat simulation game is designed to simulate the effects of what happens when you didn’t have the experience to confront with animals. Do care for your angry goat by feeding it. Find the eatables in the terrain environment which the angry goat will feed on to boost its energy. Keep an eye on the energy bar as it goes down & down & you have to feed your angry goat in time before the goat collapse & finally dies. Crush the various obstacles on the way to increase score and earn points to unlock new Angry Goats with all features. 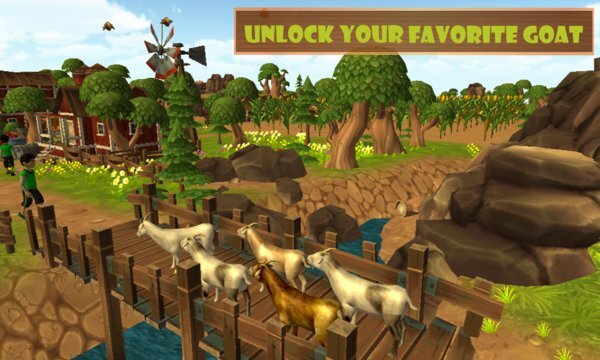 There are several angry goats for you to unlock, earn points to unlock your favorite one. The environment also contains few wild animals that move around in the jungle around the village. So beware of these wild wolves. Stay away from them & if you find any of the wolves try to run as far as you can as they might attack your angry goat. Baaaaa; if you love animal games and especially free goat simulator games then you must try Angry Goat Simulator 3D for FREE; as its best goat game among all animal simulation games of 2015. Let the crazy angry goat adventure begins! ♦ Tap on screen to attack. ♦ Tap on button to jump. ♦ Use “Arrow Keys” To Control Goat. ♦ Use “Space Key” To Jump the Goat.